Fastbraces works to straighten teeth using cutting-edge technology and principles. Imagine having your teeth alignment visibly improved in as short as 100 days! With Fastbraces, you can enjoy straighter smiles without having to wait for years for the treatment to be completed. Book Your Free Orthodontics Consultation Today! Fastbraces is a revolutionary orthodontic treatment that can give teeth straightening results in as short as 100 days of treatment period. This treatment uses cutting-edge technology to integrate the two-step process used in conventional braces into one. It is a comprehensive orthodontic treatment that can issues that can be treated by traditional braces, such as teeth crowding, crookedness, overbites, underbites, crossbites, open bites, bad bites, or gaps/spaces. The Fastbraces technology cuts the two-step process used by conventional braces that involve pulling the teeth crowns into position on the first year, with the second year focused on moving the roots into the proper position. With Fastbraces, the roots are straightened into the proper position from the first day of treatment, contributing to the much shorter overall treatment period. The Fastbraces treatment also utilises a patented process of restoring the alveolar bone (the bone where the upper teeth sockets are located), patented braces, and a patented process of treating gingivitis as a result of crooked teeth. The patented Fastbraces technology makes it possible for dentists and orthodontists to quickly straighten teeth by growing alveolar bone, while avoiding the extraction of teeth or surgical procedures on the jaw. The Fastbraces treatment addresses the same teeth misalignment issues that are treated by conventional dental braces – but in a shorter treatment time, and with increased comfort. There is also an option to get tooth-coloured ceramic braces with Fastbraces Clear which gives you the same results of the original Fastbraces system, with the additional benefit of a discreet orthodontic treatment. Quick orthodontic treatment, with results that can be seen in a few days; some treatments can be completed in approximately 100 days. Is the Fastbraces Treatment Suitable for Me? Why Choose Wimbledon Dental & Implant Centre? 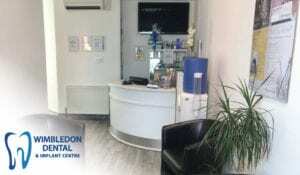 Our dedicated team of professionals at Wimbledon Dental & Implant Centre will make you feel welcome and graciously cared for, while utilising state-of-the-art facilities and treatments to give you the best possible experience. Take advantage of our Fastbraces Special Offer now! This is available only for a limited number of cases. Book a free consultation now and save £1000! We offer easy payment plans with no credit checks required, and 0% finance for up to 10 months.